Entry-level slicing with ergonomic comfort. 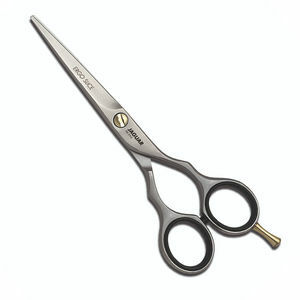 The Jaguar Pre Style Ergo has been a hairdresser's favourite for years thanks to its combination of quality, German-engineered stainless steel blades and ergonomic handles. Now Jaguar have produced a version with slicing blades so you can take your cutting to the next level. Unlike the standard Pre Style Ergo with its micro-serrated blade, the Pre Style Ergo Slice's blades are hollow ground and honed on both sides so you can use it to slice cut. The handles are the same classic ergonomic shape, being level set for a traditional feel but designed to keep your hand in a more open position that helps to reduce strain. There's also a removable finger rest and finger rings included for your comfort. 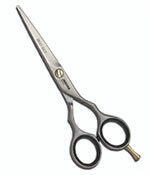 The Jaguar Pre Style Ergo Slice comes in 3 sizes: 5, 5.5 or 6 inches. £45.54 (inc. VAT) Why no VAT? We're a trade wholesaler and quote our prices without VAT to help our VAT-registered customers understand the true cost of a purchase. 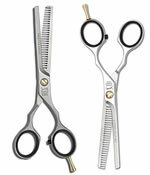 Ergonomic handle design and a micro-serrated blade with 28 teeth combine in a scissor that's perfect for hairdressing students or the newly qualified. Available in a choice of Polished or Matt finishes.